Some seafood restaurants don't serve fresh fish. They take a product that's already been frozen and processed, and then they serve it to you and charge you an exorbitant amount. You deserve to see food that's fresh and delicious! But you can avoid these places. We spoke to Jonathan Gill (!! 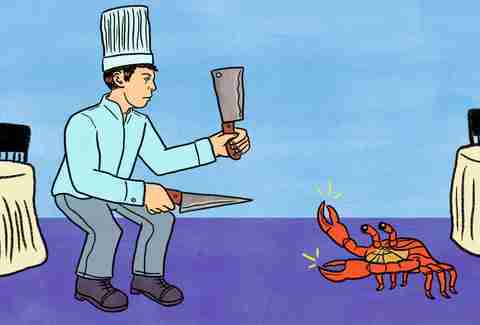 ), executive chef at Portland, Oregon's RingSide Fish House, to find out what the red flags are in a seafood restaurant. Editor's Note: These are rules for a seafood restaurant, not one that serves sushi. Sushi is required to be flash-frozen. Gill is referring to fresh fish being cooked in a seafood restaurant. "If I went to a seafood restaurant and all the fish was fried, then you know it probably came in frozen, and it might even come in like that. Or if they just serve grilled salmon or mahi-mahi, and everything else is breaded and fried, then they're not serving up fresh fish." "A good, busy restaurant is going to have fish come in every day, and it's not going to be frozen. There's no need for it, and most restaurants that specialize in seafood should be flexible enough to serve alternatives if a certain fish becomes unavailable. You're going to want to eat fish fresh, not frozen. If it's frozen, it's either out of season, shipped in from far away, or it's a processing-plant product." The menu lists the cost of the fish as "Market Price"
"Of course, the exception is if you see 'Market Price' on one of those little shacks on the pier!" "Seafood Watch is a great resource, and a great app. 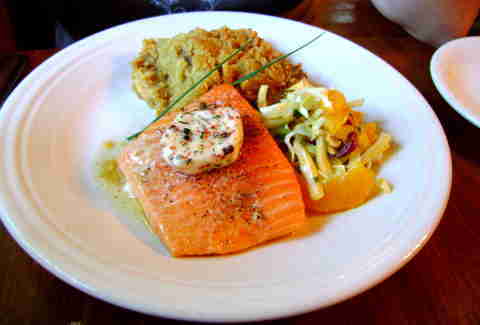 Users can recommend restaurants that have a sustainable seafood program. And restaurants can petition to get on the app by sending them menus. Granted, it's not always the most definitive list. I've worked at restaurants that have been on and not on the list, and both places sourced as sustainably as possible." 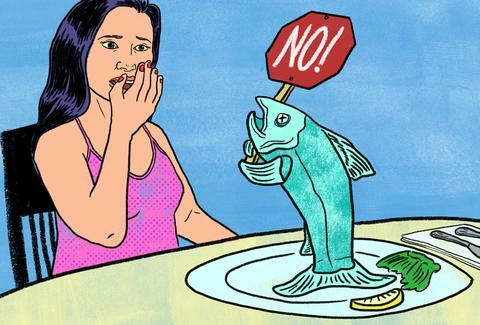 "If the menu says it's salmon, but doesn't tell you if it's wild or farmed, that's a red flag. Nobody wants to put farmed seafood on the menu, and they certainly won't highlight it. If it's wild, they're going to tell you." "I like to see restaurants serve fish skin-on -- you can look at it and tell what it is (and what it isn't!) when you're eating it. When you're getting a pan-roasted piece of fish, you want to see the skin on. There are some exceptions with fish where you don't eat the skin, like certain flatfish. But if someone tries to sell you striped bass or black bass and it comes out and has no skin, that's a red flag. "Any restaurant bringing in beautiful, fresh, whole fish (or even a filleted fish the restaurant's fishmonger takes care of) would want the skin on. Otherwise it's coming in processed. As chefs, we'd rather get in whole fish to have better control over its shelf life. If it comes in filleted, well, when was it filleted? How was it treated? You can check whole fish before you accept the delivery of it, and its shelf life will be a lot longer." "You know that a seafood restaurant knows what they're doing if they have fresh-shucked oysters. Anything that comes in live and has to be dealt with, processed, and served up in a short time frame means you're dealing with a higher-caliber restaurant. If you see steamed clams, mussels, or shellfish dishes, it tells me the restaurant's doing volume and they're treating their seafood great. If you see sea urchin, or other seafood you might not be totally familiar with that strays from the four major fish (tuna, salmon, cod, or sea bass) -- you know it's a good spot. Shrimp will also be frozen nine times out of 10." "Talk to your server and ask them where the fish is from. The better places will be able to tell you. If the waitstaff doesn't know off-hand, it's not a black mark against them, but they should be able to get you the answer pretty quick, and tell you which state it landed in. If they say, 'It's from the Pacific' -- well, yeah, duh. I'm sure it is. If they can't tell you where it's from, they probably don't get in whole, fresh fish. It's probably portion-cut and frozen." "If they're not serving oysters fresh-shucked on the half shell [Editor's Note: Ask your server if they do it! ], and they won't do it for you that way, then it's probably not the best seafood restaurant to be in. If I went to a place that only had oysters Rockefeller, I'd put them in the same category as I would a chain restaurant. I'd be a little suspicious. It probably came in frozen -- you can buy oysters pasteurized and pre-shucked on the half shell. 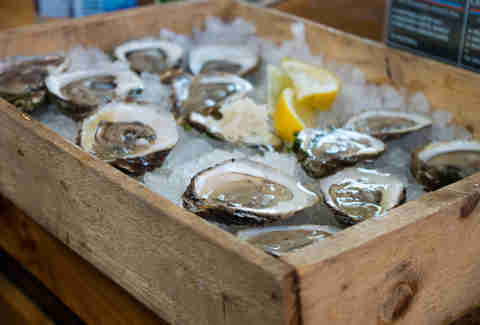 Instead, you'd want the restaurant serving oysters from a place closest to you geographically. I'd look for something that's as local as it can be." Lee Breslouer is a senior writer for Thrillist, and enjoys fried fish. Follow him to cheap meals @LeeBreslouer.